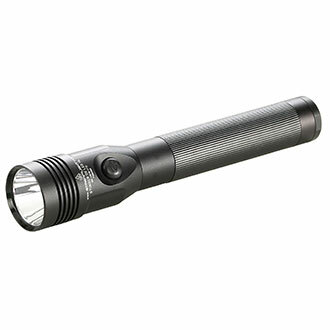 The compact Streamlight Stinger DS LED HL Rechargeable Flashlight produces a powerful 640 lumens. A deep-dish parabolic reflector delivers a concentrated beam with optimum peripheral illumination. Strobe mode can be used to disorient a suspect or signal your location. Dual-switch technology allows you to access three lighting modes and strobe with the tailcap or head-mounted switch. Machined aircraft aluminum construction for long-lasting durability. Meets FL1 standards for water and impact resistance. This is truly an amazing flashlight that provides light like the sun whenever needed. I have spent time with QM associates (two wrong sizes) attempting to locate a closed pouch for my duty rig to carry this monster in the jail. Any suggestions? I may have to carry this with an open holder.